As I get older, I feel the need to open up to friends and family about my idiosyncrasies. Most of them know I’m slightly psychic (you’re skeptical? I predicted that!) and have long experienced what I’m loosely calling “prophetic dreams.” It isn’t that God is sending me a list of the next Ten Commandments that He forget to give to Moses; no, it’s more like the spiritual equivalent of a fortune cookie. Rather a stone’s throw from what we’ve already learned from the Bible, don’t you think? But I really needed that “word from God” – even if it’s actually only something my sleeping psyche is telling me and it’s a re-hash of what I already believe. I’ve been feeling hinky lately (as we say in Jersey) and it seemed like things were going haywire. A week and a half ago, my well pump stopped working and my family was without running water for a week. It was like we were camping in our own home – suddenly we were back in the olden days. We couldn’t wash clothes, take a shower, or even wash our hands. At the same time, I was being treated for a condition called Sjogren’s Syndrome – a condition which completely dehydrates you. It made my eyes so dry that I’d wake up feeling as if they were glued shut. It made my mouth so dry that my teeth actually began to chip and fall out! Water had played a role in a previous prophetic dream I had, as one of the “three keys to life,” which I wrote about on my blog a year or two ago. With the events of the past couple of weeks, I got to see firsthand how important water is in our lives, and in our bodies. I’ve also felt that my connection to my faith has been drying up. Not that I’m losing faith; it’s more like I’m not finding the spiritual sustenance that would lead me back to restoration when I hit a dry patch. I’ve focused on chronic pain and MS symptoms instead of counting my blessings each morning, and it’s kept me from doing things that usually lift me up, like writing posts on this bloggie. Luckily, I always (eventually) find my way back to my senses, and I throw my whole heart into praying and trusting God, while at the same time, making a practical list of what I need to do to get things moving in the right direction. Nothing like a nudge from above to get back into the flow again. The Ten Commandments: Law or Teaching? Our women’s circle is studying Exodus and one of the things that we discussed last night is teaching vs. law. In older translations of the Bible, the Ten Commandments are laws. Break this and you will be punished! Given our record for not managing to do the tasks God assigns us, this is pretty ominous. We’ve failed in the past. We are likely to fail again in the future. That doesn’t bode well for our chances of success. But think of them in terms of the more modern translation, a translation that more accurately captures the meaning of the Hebrew word. The Ten Commandments are teachings. We are students to be taught. We are students to grow into this knowledge. It’s a very subtle difference, but doesn’t it make you feel more hopeful? I didn’t get it right yesterday, but I’m a student of God’s Teachings. I can learn. You can learn. 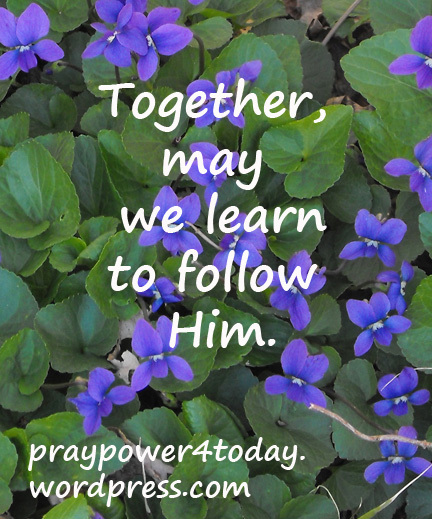 Together, we can learn to follow Him. It’s hard for me to imagine living religiously pre-Christ. It seems like every second or third thing made you unclean. This, of course, meant that you had to pay for a sacrifice and various cleaning rituals so that you could once again enter the temple and come before the presence of God. Until something else made you unclean. And simply living as a female would do put you into that category. But Christ’s sacrifice took us out of that world and into this one. By His Grace, we are made clean. Period. It isn’t through our own actions but is His Gift to Us. What a cause for celebration! Take a minute an enjoy this festive Easter song . This isn’t the choir at Florissant Presbyterian Church, but it is the anthem that we sang today. Sing, rejoice and celebrate! You have been made clean. Not gonna lie; I’m kind of falling apart right now. I’m beset with a host of physical complaints — too small to dignify by naming, but taken together, quite wearying. And I’m mourning four deaths in seven months, with another looming. I’m tired and sore in spirit and flesh. The up side? I’m ripe for a resurrection, just in time for Easter. In her book A Tree Full of Angels: Seeing the Holy in the Ordinary, Marcrina Wiederkehr writes about the voids in our beings, and how they provide God space to work within us. In other words, I may be at my shabbiest now, full of holes, but those very holes give God space to fill me, heal me, work God’s grace within me. Sure, it would be nice to be wholly holy. But that doesn’t give God any room to maneuver, to effect change. God not only accepts us as ragged and full of holes, God loves us this way. As long as we are open to God’s presence in us, filling and patching and making us new, we have the opportunity for real greatness. And real grace. So as holey as I feel right now, I know I’m in a good place. In fact, I couldn’t be in a better one. I’m ready for God to enter the voids and to make me whole. There couldn’t be a better time for it. Happy Easter, everyone! Rehearsal was Thursday and I’ve had this wretched song stuck in my head ever since. No, it isn’t actually wretched. It’s Caribbean and way upbeat. Wretched doesn’t accurately describe the song, but it does describe the experience of having the chorus stuck in your head for four days. A jingle for Jesus. He’s right. Just like a jingle it’s been in my head for days and, no doubt, is going to be there for days to come. After all, we’re singing it on Easter which is funny since this is a Christmas song. Why sing Christmas songs at Easter? Why not sing an Easter song? Easter music is grand and intense. It’s magnificent as befits something as serious as the crucifixion. Yes, being nailed to a cross is serious business but we get hung up on it and it weighs us down. We have to be so good to be worthy of such a huge sacrifice. Are you good enough to receive his word? And that’s something we focus on way too much – Worthiness. We forget that we are saved, not by our worthiness, but by His Grace. Isn’t that amazing news? And that’s where Halle Halle Halle comes in and makes sense. I can see it carrying His people down the aisles and into the world to spread the News to all. Imagine the spring in our step as we carry out his work with a chorus of Halle Halle Halle in our heads and in our hearts. A kindness is never wasted. It seems like such an old-fashioned sentiment that when I created the graphic for today, nothing looked right until I used my grandmother’s china as a backdrop. Kindness is something that I’ve spent a lot of time thinking about this week, perhaps because I was so recently the recipient. We’re all busy people. When I asked my friends for prayers, everyone could have said yes and hurried on their way. But they took a few minutes for a chat and hug and even to send a few funnies via Facebook. I’ve been receiving these kindnesses all week. As I receive them, I feel inspired to send them out to others both through Facebook and Pinterest. Then a funny thing happened. I got a message from one of the recipients telling me how much she appreciated that I would even take the time to talk to her because so many others won’t. Kindness is never wasted and you never know when your small act will mean a great deal to someone with a hurting heart. It is one of the most Christlike things that we can do. It may sound old fashioned, it may even be old fashioned, but it is a truly amazing thing, because kindness begets kindness. Why not find a way to drop a small ray of kindness into someone’s life today? I grew up three doors down from a girl named Geeter (a play on her given name, Brigitta). I didn’t know her well — she was a public school girl, and I went to Catholic school — but I certainly knew of her. In some circles, Geeter was famous. I can’t vouch for the veracity of that statement; the only thing I knew for sure that Geeter could do was make fun of me and throw rocks at my head. Still, that anonymous little girl’s faith in her idol has stuck with me all these years. She really believed that Geeter could do anything. I’ll be the first to admit my inadequacies. There are plenty of times when I look at a situation and think, “I can’t do that.” But it behooves me to remember one thing: God can. God really can do anything. And that’s not just childish idol worship; it’s the bona fide truth. I’ve seen it time and again. I run up against what I think is an insurmountable challenge, and somehow, God walks me through it. It is nothing short of miraculous. Yes, miracles happen daily, and often at our lowest moments. That’s how they work. So the next time you’re staring up at the metaphoric mountain in your path, just remember: Even if you can’t, God can. And does. So breathe, relax and let God take over. It really is that easy. If that little girl could believe it of a kid named Geeter, how can we not believe it of God? Finally, brothers and sisters, whatever is true, whatever is noble, whatever is right, whatever is pure, whatever is lovely, whatever is admirable—if anything is excellent or praiseworthy—think about such things …. and the God of peace will be with you. On NPR, the news report said that there had been a suicide bomber in Afghanistan. I realized I was already in a cranky mood this morning and wisely changed the channel. But later, I looked up the story on the internet, almost as if I wanted to add to my own irritation. Right on cue, I was agitated after skimming the article. A guy in a uniform worked his way into a heavily fortified compound in Kabul and killed several police officers. That angered me. The Taliban claimed responsibility, saying they wanted to disrupt an upcoming election. That really ticked me off. The government spokesman, Sediq Sediqqi, said the death toll stood at six and an investigation was underway. That irked me too. Who would name a person Sediq when the family’s last name is Seddiqi?!? Criminy. Soon I was hip to my own jive. I realized I was now just looking for things to confirm my sense that there was always a reason to be in a bad mood! The thing is, there’s always a way to change the channel in your mind, and put yourself into a good mood. Listen to your soul’s early warning system. You’ll get clear signals, such as feeling tight or tense for apparently no reason; being snappish with those around you; a feeling of being out of control or disconnected. If you find yourself feeling this way, stop focusing on the thing that’s riling you up and leave the room. Clear your head. Take deep breaths. Life is never all or nothing, although it may seem like it when you’re really worked up. You always do this! Or, Life never works out for me! But you know that’s just pessimistic propaganda. You can change how you feel by remembering that you are blessed. God knows you by name. In fact, he knows everything about you and still loves you. That alone is an awesome game-changer. Reel in your thoughts like you would a fishing line. Don’t let your mind get too far off course, and don’t pull in what you don’t want. So you hooked an old shoe or a tin can? Throw it back into the lake. Don’t get hung up on the stuff you should just let float by. Get into the habit of seeing the good in people, no matter what attitude they bring into the room with them. Remember that a good mood is as contagious as a bad one, and you control what you put out into the world. Be a light spirit, even when the world around you seems heavy. It makes life so much better when you look for the good in people – or, should I say: when you look for the God in people.